Walk outside some clear evening this summer, and look to the south (assuming you’re in the Northern hemisphere!). You’ll see a bright red star – Antares – and if you’re familiar with the night sky, you’ll recognize the constellation Scorpius. 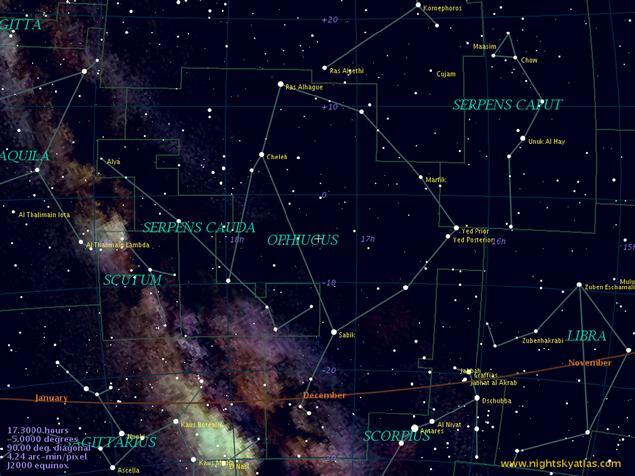 Look above Scorpius, into a fairly dark area without many bright stars. This is the constellation of Opiuchus (a bit of trivia here: Opiuchus is actually the 13th Zodiacal constellation, but having only 12 makes things simpler – sort of like how the Big Ten Conference continues to call itself the Big Ten even though it has somewhere between 12 and 16 teams, depending on which reports and rumors you believe). While you’re looking at Opiuchus, think about the mantra of some on the Right, that government can’t do anything right. And then think about this: somewhere in the patch of sky containing Opiuchus, a spaceship called Voyager 1 is continuing the journey begun on September 5, 1977; Voyager 2, actually launched 16 days earlier, and Voyager 1 had a combined cost of about $250 million (not including support in the ensuing years, which has raised the entire mission cost to somewhere around $900 million). Both spaceships have continued to perform important scientific missions as they hurtle in roughly opposite directions towards stars they won’t reach for 40,000 years. Their nuclear power plants will stop long before that – another 10 years or so – but as long as they have power they will continue to send data back to Earth. Currently, Voyager 1 is about 12,800,500,000 miles from Earth (that’s over 12 billion miles). Voyager 2 is about 10 1/2 billion miles in the opposite direction, in the constellation Pavo (the Peacock) in the southern hemisphere. And we’re still learning. Data from Voyager 1 has revealed that the structure of the solar system isn’t quite what we thought. There’s a layer at the edge that wasn’t suspected. Is this important? Well, we don’t know, and won’t for a long time. Did 15th century Europe know that the islands they had discovered in the western ocean were one day going to be of vital importance to western civilization? Here’s what we do know: science matters, even if you try to deny the sometimes uncomfortable truth. And science at the level of the Voyager missions is only done at the national level. No private research lab is ever going to do science at this scale. Government does, and often does it very well even at the bleeding edge, and in these times of budget cuts and debt reduction, we would be wise to remember that.